This is a 2 in 1 punch bag wall bracket with a pull up bar which excels in quality. It’s unique wall mounted pull up bar enables many different hand positions to be used in order to define and work more muscles in your arms and back. Wall bracket comes with a solid steel hook rather than D-shackles which allow you to place and remove a punchbag with ease. 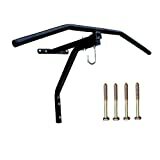 The 2 in 1 wall bracket is a great mounting frame for Punch bags, body bags, maize bags, floor to ceiling balls etc. as well as chinning exercises. This wall bracket is made from steel and is electrically powder coated at high temperatures to give it anti rust properties. It comes flat packed with all the required bolts and plugs. The design allows you to place the bracket on any solid brick wall whether it is indoors or outdoors.